TRANSMITTER is a young, creative language school in the heart of Neukölln. Learn German with us in a friendly and familiar atmosphere in small groups of 5 to 10 students. Our school is located in in the middle of the lively Schillerkiez just a stone's throw from Tempelhofer Feld, a spacious park on the grounds of the historic airport. Here, you will have the opportunity to learn German while enjoying some biscuits, a cup of tea or even a glass of wine and talk with other students from all over the world about topics you are really interested in - and that of course in German! For us, it is really important that our students acquire actual speaking skills. By combining a variety of different teaching methods, we make sure to cater to our students' individual needs. 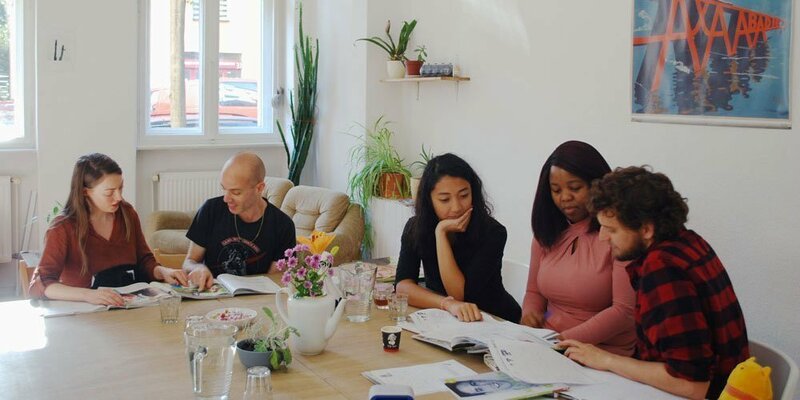 Our team consists of competent, experienced German teachers who are looking forward to supporting you personally and help you during the learning process. In addition to our course program, we also offer our students social activities outside of the German courses and are happy to get to know you a little bit better over a nice drink at our Stammtisch.